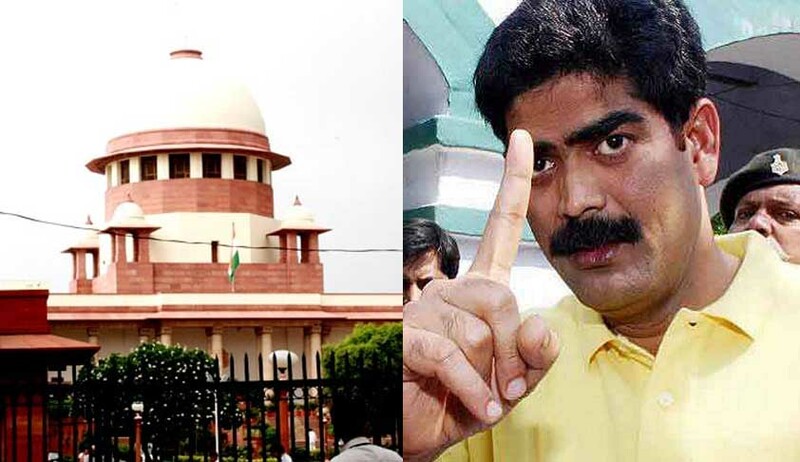 A week after the Supreme Court cancelled Mohd Shahabuddin’s bail given by the Patna High Court, a fresh plea has been filed in the apex court seeking the transfer of the controversial gangster-turned-RJD leader to any jail outside Bihar and conduct of his trials in all pending cases through video conferencing. While cancelling his bail on September 30, a bench of justices Prafullah Chandra Ghosh and Amitava Roy had said the “discretion to release must be applied in judicious manner and not as a matter of course”. The plea filed by Siwan-based Chandrakeshwar Prasad alias Chanda Babu whose three sons were killed in two separate incidents, alleged that Shahabuddin's confinement to the prisons of Bihar has failed to deter him in any manner as he has been abusing the rules and regulations of jail with impunity in collusion with the jail administrations. Prasad was the petitioner in the case wherein the SC had cancelled Shahabuddin’s bail also. “Till the time Shahabuddin is in Bihar, it is not only very difficult to have fair trial in the pending cases but there is serious threat to the life of the Petitioner as well as witnesses of other cases also. Till date Shahabuddin has been booked in at least 75 cases, out of which in 10 cases, he has been convicted and in at least 45 cases, he is facing trial. Out of 10 convicted cases, he is facing life imprisonment in two cases and 10 years rigorous imprisonment in one case. Out of 45 pending cases, at least 21 cases are those where maximum life sentence is seven years and more which include nine cases for the charge of murder and four for attempt to murder”, the plea said. “The respondent violated jail manuals with impunity in collusion with the jail officials and has been found to be using jail as his personal fiefdom”, it added. Prasad is an eye witness to the murder of his third son who has also got killed by Respondent No. 3 (Shahabuddin) as he was an eye-witness to the murder of his two brothers. The trial in the murder of third son is still pending, the plea said. Prasad was also the petitioner on whose petition the apex court cancelled the bail of Shahabuddin. His plea was also supported by Bihar government which had also filed separate plea against the Patna High Court order granting bail. “The order passed by the High Court granting bail to the respondent-accused (Shahabuddin) is set aside and the state is directed to take all consequential steps, inter alia, for taking him to custody forthwith,” SC had said on September 30 cancelling his bail. The Bench, which clarified that it was not expressing any opinion on the merits of the case pending against the RJD leader, asked the Bihar government and the concerned court to take “all steps as contemplated in law to dispose of the case, as early as possible”. Shahabuddin was granted bail by the Patna High Court on September 7 in the Rajiv Roshan murder case and was released from Bhagalpur jail on September 10. He has already remained in jail for 11 years in connection with several cases.